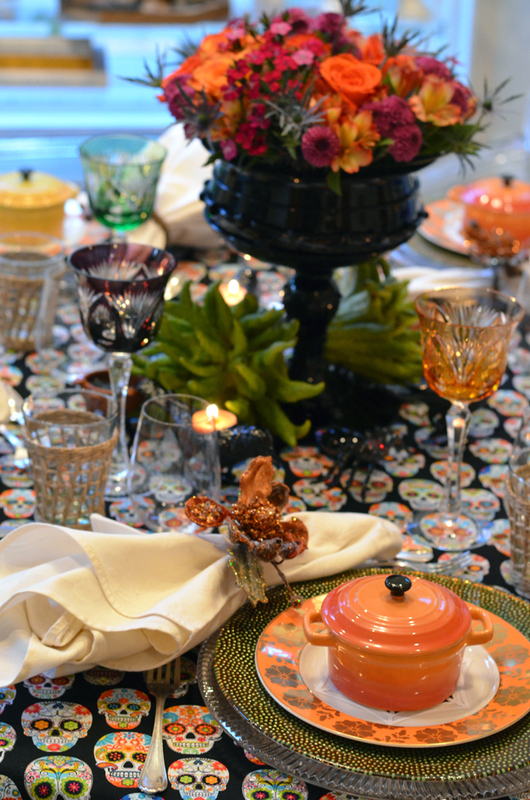 In honor of Fall and Halloween, Jessica, our CEO and Creative Director planned a festive and delicious Mexican dinner for a lucky few of her friends. Jessica's dinners are works of art. Her creative energy is evident in all the details, from the menu down to the tablescape and divine food. She prepares these evenings with joy and pure thoughtfulness, which translates to an unforgettable dinner for those who attend. The fun skull tablecloth is a nod to the Day of the Dead (Dia de los Muertos, which is on November 1st). You can find a similar fabric here. The night began with some delicious and real Mexican Margaritas prepared by Bill, her husband. What makes a real Mexican Margarita you ask? Well, instead of using a splash of Cointreau, Bill uses Controy (it's the Mexican version of this orange liqueur only found in Mexico). Then, while guests enjoyed their Margaritas, Jessica offered her guests Ceviche Acapulqueño in a small glass. This is a type of Mexican ceviche made with small shrimp, tomatoes and avocados. This dish is light and hearty at the same time. Then, it was time for the main event- the seated dinner in their beautiful sun room with an elegant and festive table setting worth celebrating and photographing from every angle. You can read about Jessica's Paella Night here, and Dinner in the Sunroom here. How are you planning on showering your love to friends this fall? Do you have any fun Halloween celebrations coming up? Posted on October 5, 2015 by Jessica Jesse and filed under Entertaining and tagged Halloween tablescape.